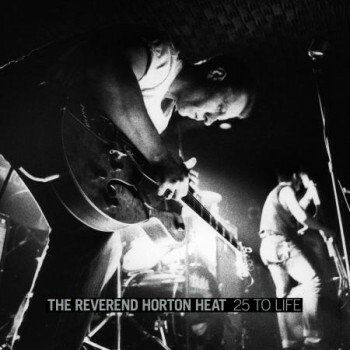 Over a quarter of a century Texas psychobilly trio Reverend Horton Heat have been blazing a trail back and forth across North America, earning themselves a reputation as one of the very best live acts out there. Having seen them more than a dozen times myself I can personally attest to that. Now they've released a live DVD/CD 25 To Life. For review purposes I'll be solely focusing on the audio component. There's certainly something that gets missed without the visual stage antics, but hopefully that will entice you out to one of their shows if you've never been. The career-spanning set was recorded at a live gig in San Francisco last year as the band toured to promote Laughin' And Cryin'. The amped up numbers are the standouts, as they are in person. The energetic "400 Bucks", "The Baddest of the Bad", and the catchy "Callin' In Twisted" count among the best on offer here. Surprisingly, so to does "Jimbo Song", and ode to the band's bassist Jimbo Wallace that usually overstays it's welcome. That brings us to the biggest drawback of the record, songs overstaying their welcome. Extended jams on numbers like "The Devil's Chasin' Me", "Psychobilly Freakout", and "Big Red Rocket of Love" eat up time that could be devoted to including more songs. As it stands, fan favorites like "Bales of Cocaine", "Eat Steak", "Five-O Ford", "Galaxy 500", and "Cowboy Love" all get sacrificed in the name of self-indulgent noodling. One of the brightest spots of the Rev' is the sense of humour in the songs. Tracks like the long-time favorite "Where In the Hell Did You Go With My Toothbrush" and "Please Don't Take the Baby To the Liquor Store" from their last album are nearly laugh-out-loud. Witty stage banter usually plays off this in the live setting. Unfortunately, this performance is almost completely devoid of that. Despite the criticisms I have, the album is still a much more raucous, rollicking live document than you're likely to find from any other band this year. Best tracks: "Callin' In Twisted", "Where In the Hell Did You Go With My Toothbrush"